HOUSTON  Few have forgotten the morning of May 3, 2010 when learning that Kelly Danaher, 36, Huffman ISD teacher, husband and father had been gunned down on his own property. Now, the man that was behind the pistol has been convicted for a second time of murder. The punishment phase of that trial began on Tuesday. Previously, he had been sentenced to 40 years in the penitentiary. Raul Rodrigues got a second trail, his previous conviction overturned because the jury instructions were deemed unclear. Rodriquez had claimed that when he went with his video camera and his pistol to a party he had determined was too loud that he was acting in self defense to shoot and kill the teacher. This was after calling in law enforcement that had patrolled to the party without incident. 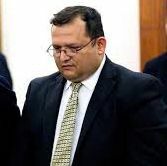 Rodriguez had claimed that when he went to his neighbors party he had been lunged at by party attendees and was within his rights to defend himself with deadly force under the Texas stand your ground law. The jury deliberated three hours before reaching their decision in the last case, convicting Rodriguez. They had also viewed the videotape taken by Rodriguez of the incident several times. The video tape clearly makes audible that the man making the tape says several times, I am in fear for my life. He had also printed out a copy of the public nuissance law and planned to use it and the video tape to authorities to make his point. He was also recorded himself talking on his cell phone and saying he did not intend to lose to these people. A comment that presecutor Johnson did not let slip past attention. She also brought attention to his actions prior to firing twice and killing Danaher. CROSBY  Newport Property Owners Association (NPOAN) awaits the closing to purchase Newport Golf Course and Convention Center but they already have a new Director of Events. Logsdon continues as President until the end of November. Thereafter the new President of the Crosby-Huffman Chamber of Commerce is to be Kim Harris, the current Office Coordinator. Currently, Creek Scott owns the golf course and center. During the monthly luncheon, Logsdon described with emotion the increasing role and impact of the Chamber in the community during her resignation speech. She cited the impact that the success of Crosby Cougars football team that it not only bestows a positive contribution to the image of Crosby, it also attracts families to participate in the football program. During the four and a half years that Logsdon has served the Chamber has made steady progress. The first change she presided over was the purchase of the Chamber Building on First Street. An initiative the board had sought for about three months. She began on August 1, 2011 the house was purchased on Nov. 11. She has elevated recognition of the chamber as being to help business and the community as a whole with the community. She facilitated the recognition by elected officials of the Chamber. And at the conclusion of her term will have added 84 new members since January. Crosby Church hosted the luncheon and Pastor Smith spoke of the Crosby Care initiative that takes families to a local Wal-Mart bestowing a $100 maximimum to needy familes to have a Christmas. For details on helping uot with Crosby care call (281) 328-1310. 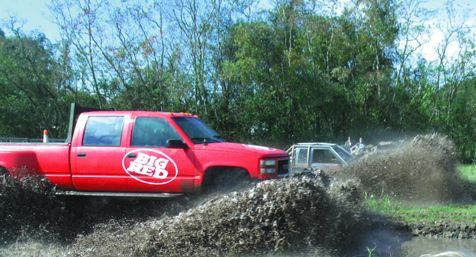 CROSBY  A throng of folks staired at mud filled ditches with breathless anticipation as ATVs, jeeps and monster trucks attepted to be the first across and still running last Sunday. Car efficienatoes teamed to see hot rods and beautiful examples of car craft on display. Crosby Volunteer Fire Department demonstrated how to disassemble a vehicle perfectly capable of running (donated by Turner Chevrolet) and extract people without hurting them. Craft booths offered a wide variety of merchandise seldom found. There were consessions for the hungry and ame booths for more fun. One of the first sights one could see were kids climbing the climbing walls and playing on the numerous inflatables. Croby Church has multiple campuses, for information call (281) 328-1310. 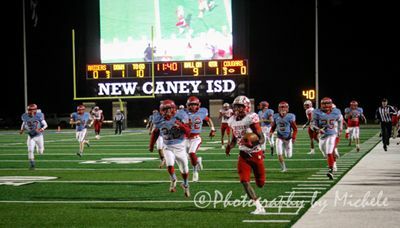 NEW CANEY  The Crosby Cougars again put on an exhibition last Friday against the Lumberton Raiders winning 42 to 13. It didnt take long for the Cougars (about 24 seconds) to demonstrate they were the dominant team in the non-conference playoff game. Craig Sqwirl Williams blasted a zig zag pattern through the Raiders line for a 91 yard rushing touchdown. The Crosby quarterback had an interception on their next possession and Lumberton brought it all the way to the 2 yard line before giving it back when the Cougar defense shut them down. The next touchdown came on the heels of a Tristan Cotton 32 yard pass to Trey Edwards. Juan Ochoa was perfect kicking all night. It took nearly 3 minutes for Crosby to score again, Williams zig zagged through the middle this time for only 3 yards. Crosbys defense would blast a hole through the Raiders and another almost certain drive would be defeated. Shammah Gray-Brooks snatched a 27 yard touchdown pass after Williams had amassed 145 yards with just over 8 minutes still left in the half. Jordan Hill caught the next big touchdown pass to exit the 1/2 at 35 to nothing. A seesaw battle raged in the third quarter, that was rocked out by Sherman McGee crashing though for a three yard touchdown. The Raiders scored their first touchdown in the 3rd with 9 minutes left from eleven yards out. A series of turnovers, Crosby from two interceptions and the Raiders were made to fumble twice, brought it all to the one yard line where the Raiders were strapped down again and forced to turn over on downs. Lumbertons Caleb Thomas would punch through to make the next touchdown from a yard out but the attempt for two points failed. The game wrapped with another recovered fumble by Crosby with a minute left. The Cougars play Ridge Point on Saturday, Nov. 21 as the visiting team at NRG Stadium on I.H. 610 near Kirby in Houston sometime between 5:00 and 5:30 p.m. or 45 minutes after the conclusion of the game before. BARRETT STATION  As Harris County Precinct 2 completes their project to widen FM 2100 here, TXDoT is now working to widen the strip of bridgework between US 90 south to FM 1942. The road widening is critical to achieve the goal of four lanes out of Barrett to Crosby and Highlands. Although last week made the trip an hour longer than usual. While this project gets underway, the inside lanes were blocked last week and beginning Wednesday of this week, the outside lanes will be closed. 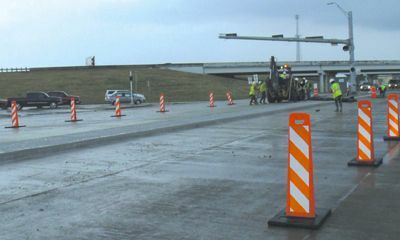 Much delay was experienced as traffic waited to clear the inside lanes and gain access to US 90 southbound from FM 2100 last week. Much of this work should be more easily passible by the end of the month. CROSBY  The Eastside Veterans Celebration hosted events last week to educate locals on what veterans contribute and honor the veterans themselves. Efforts to do this included year long meetings, contributions of time and materials and the sale of raffle tickets for a quilt and three firearms. Attendance was off this year as rainy weather not only negated Saturdays parade but kept many at home tending to their flooded locations from the previous weekend. This year the winners of the raffles are Betty Michalsky for both the automatic rifle and the guilt, Dixon Davis won the .380 pistol and Justin Gilmore won a Henry .30-30 rifle. Events include the Red, White and U. celebration at the High School followed by a fireworks display. The glee club sang, the Cougar Stars danced, the JROTC cadets spoke and military protocol was observed. On Friday, thirteen entries cooked for the Veterans Cook-Off and the Flag Retirement Ceremony behind the David H. McNerney American Legion Hall Post 658 was fairly attended. 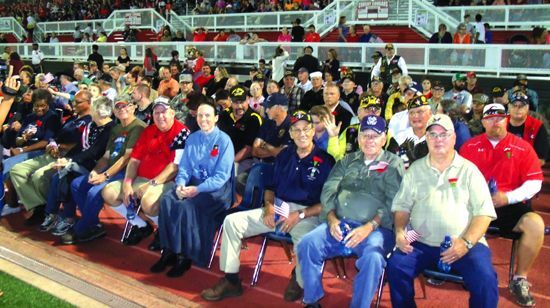 Barbecue was the fair on Saturday as local veterans observed the posting of the colors, the M.I.A. ceremony, a speaking program and military protocol was observed. Open ceremonies were brief but thorough. The raffle was held an hour earlier but few were still in attendance. The list of contributors continues to grow but there are examples of individuals that contributed beyond the call of duty. Examples like Arlens Grocery sending over 15 loaves of bread at the last minute upon hearing there was none for the veterans accepting no payment and Terry Walkup saying it is the least we can do. HIGHLANDS  Last Saturday, some homes near the river were flooded and the river could be measured to have reached about 8 feet higher than normal before cresting. Harris County Flood Control District says the San Jacinto River reached six feet higher. An EF-0 tornado somewhere above 75 miles per hour and below 85 m.p.h. struck the northern perimeters of the area at about 5:00 a.m. Saturday. The twister downed power lines and closed FM 2100. 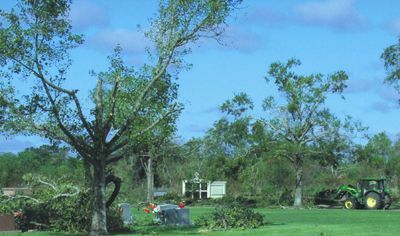 One of the locations that it touched down was Sterling-White Cemetery and Funeral Home. It appeared some damage was done to the bell tower. BARRETT STATION  Just south of the Barrett Grocery, a Harris County Sheriffs barricade was erected on FM 2100. Getting to Highlands would be a challenge. CROSBY  The thirteen inches of rain measured by the Harris County Flood Control District here on Saturday was manifest in the Weingartens Shopping Center with more than four inches of water on the floors of local shops. Monday, many stores were still recovering and shop vacuums running were a common sound. There have been reports of structural damages due to high winds from tornadoes that touched down in areas including Pasadena, La Porte, Highlands and Friendswood. Damage assessment teams from Harris County (for unincorporated areas of the county), the City of Houston, and City of La Porte went into hard-hit areas after heavy rainfall subsided Saturday, and will continue to meet with residents who were affected by heavy rain and winds. The Harris County Flood Control District is also available to take4 flooding reports at 713-684-4000 from 7:30 am  4:30 pm. The Flood Control District has a Storm Center at www.hcfcd.org/storm-center with helpful, printable resources, including a guide on how to create and implement a family flood preparedness plan and a family emergency kit checklist. REMINDER: When faced with a flooding situation: STAY PUT wherever you are, unless your life is threatened or you are ordered to evacuate and do not drive or walk into high water areas. The Flood Control District urges all residents to monitor rainfall and bayou water levels on its Harris County Regional Flood Warning System website (desktop and mobile versions) at www.harriscounty fws.org. HARRIS COUNTY  Local voters showed support for their elected officials and passed every proposition in the state, county, and City of Baytown on Tuesday. The City of Baytown had 24 Propositions and passed every one as they tackle their Charter issues. Crosbys water district HCMUD#1 passed their proposition 351 to 164 or 68% to 31%. The Highlands Water District, HCWCID No. 1 passed their bond proposition 203 to 144. $16 M. will be spent on making the water and sewer service in Highlands better over the next 8 years. In Harris County Propositions all seven passed. Proposition 1 for road improvements at about $700 M. passed by 73% to 27%. Proposition 4 for flood control work passed 74% to 26%. So the county can spend $64 M. to drain the areas. One Proposition that did not pass was the City of Houston, Proposition 1, the HERO proposition was down 39 to 61% all election day. For Mayor of Houston, Sylvester Turner had 32% and Bill King had 25% while Adrian Garcia had 15%. Turner and King will face each other again in a run-off election. AUSTIN  According to Lieutenant Governor Dan Patrick, “Texans have spoken loud and clear by voting all seven propositions into law today from property tax relief to transportation.